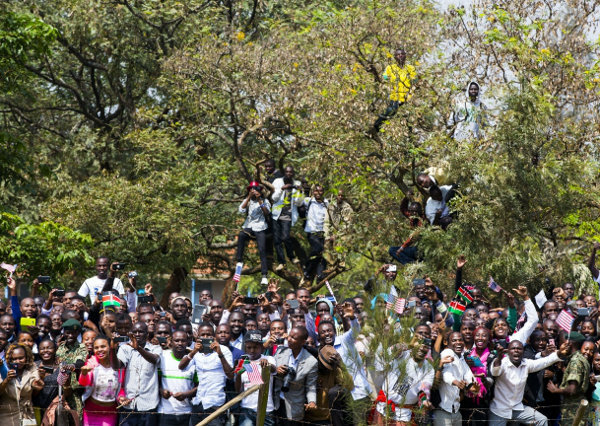 Crowds line up at the fence line and wait in trees for a view of President Barack Obama disembarking Marine One upon arrival at the Kenyatta landing zone in Nairobi, Kenya. Our Nairobi-based journalist Dinfin Mulupi shares her experiences from US President Barack Obama’s visit to Kenya last week. Nairobi was also hosting the Global Entrepreneurship Summit (GES), an annual gathering of entrepreneurs, business leaders and high-level government officials. Obama officially opened the GES 2015. Days before the president’s arrival, several of the world’s leading business personalities jetted into Nairobi. Movers and shakers at the summit included Zimbabwean telecoms tycoon Strive Masiyiwa, AOL co-founder Steve Case, Airbnb CEO Brian Chesky, Nigerian billionaire Tony Elumelu, British businessman Richard Branson, Mara Group founder Ashish Thakkar and Senegalese-American musician and entrepreneur Akon. Ahead of Obama’s visit, the government mounted a beautification exercise with roads re-carpeted, grass planted, and beggars and street children flushed out of the city centre. The excitement hit the roof on Friday as local TV stations ran all day live coverage of Obama’s “homecoming”. Journalists camped at the airport waiting for his arrival. Many people didn’t go to work, despite the government insisting it was not a public holiday. By 2pm, when some major highways were shut down, most people had left Nairobi’s CBD. Saturday and Sunday the capital literally went into lockdown. Nearly all shops in the CBD were closed, including some of the larger supermarket outlets. The only places that seemed to have crowds were locations Obama visited and highways people expected his motorcade to pass. It is estimated traders lost billions of shillings in the three days Nairobi turned into a ghost town. But five-star hotels reaped big as many were fully booked, hosting the over 1,200 guests who attended the GES. Security was tight at the hotels, and in most of Nairobi, amidst fears Al-Shabaab militants would attempt an attack. The euphoria was evident all weekend long as dancers showed up to entertain crowds that gathered to watch the motorcade. Matatus (minibus taxis) flew US and Kenyan flags. Corporate firms erected billboards welcoming ‘POTUS’ to Nairobi. Some babies born over the weekend were even given Obama-related names. Local media’s heavy coverage of Obama’s armoured limousine (aka “The Beast”) and Air Force One, sparked anger on Twitter from people who felt all the focus on Obama’s “toys” drew attention away from the real purpose of the visit. Many Kenyans believe the country will benefit economically from Obama’s visit and the GES. Over the weekend a number of deals were already announced. General Electric (GE) said it has secured a US$155m contract to build a 100MW wind power farm in Kajiado County; while US solar company SkyPower Global signed a $2.2bn deal for the development of 1GW of energy projects in Kenya that will employ 25,000 people over the next five years. Obama declared he had secured more than $1bn in new commitments to support entrepreneurs. Money was also doled out to support women and youth entrepreneurs. The Coca-Cola Africa Foundation, for instance, announced a $4.5m investment to train 25,000 youths in six African countries. Obama’s trip succeeded in casting the light on Africa and entrepreneurship. Although the weekend was exhausting – running around from one event to the next interview – it was certainly one to remember.